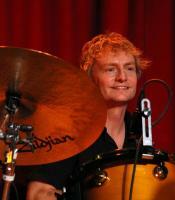 Steve Ebe is a fixture in Nashville's music scene as one of the town's most prolific drummers. Born in Joplin, Missouri, with a jukebox man for a dad, Steve’s early exposure to 45 rpm records sparked an interest in music. He started drumming at the age of 9, and by age 11, he was playing in a rock band. Moving to Memphis as a teenager led to two years on the snare line with the DCI drum & bugle corps “Memphis Blues Brass Band”, and a Bachelor of Music degree from the University of Memphis. Ebe stayed active on the Memphis music scene, playing with Carl Perkins (Sun Records), Duck Dunn (Stax Records legend), Larry Raspberry & the Highsteppers, Shawn Lane (guitar virtuoso) and many more. Steve’s partnership with Ross Rice, Kye Kennedy, Steve Arnold and Peter Hyrka, collectively known as the band, Human Radio, produced the hit "Me & Elvis" (Columbia Records), in 1990. Ebe moved to Nashville when the entire band relocated in 1992. A versatile and accomplished player, he easily found work as a sideman for a variety of rock and country acts, including Kim Richey, Sonny Landreth, Webb Wilder, The Little River Band, The Box Tops (featuring Alex Chilton), Marty Stuart, George Ducas, Tanya Tucker, the Dixie Chicks and others. Recently, he has kept busy with recording sessions, including music for the ABC TV series “Nashville” (produced by Buddy Miller), a new album with Human Radio, and playing live with The Long Players, Guilty Pleasures, Twelve Against Nature, Allgood, Make Me Smile, Aquavelvet and others. In addition, Steve is one of Nashville’s best known drum instructors and teaches an average of 40-50 private students per week at Fork’s Drum Closet.